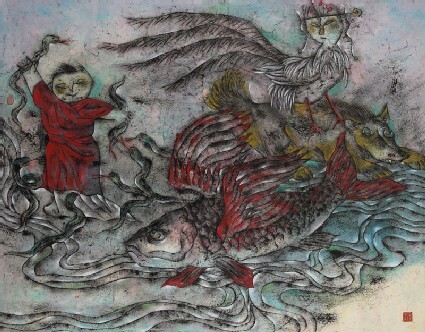 Shao Fei studied guohua painting with her mother who was also an oil painter. From 1970-1976, she served in the army. In 1976 she joined the Beijing Painting Academy, and in 1979 and 1980 was active in the dissident Stars Group (Xingxing pai) with Wang Keping, Ma Desheng and the poet Bei Dao, whom she later married and with whom she lived in Davis, California. They returned to settle in Beijing in 1999.